Legbars were the second autosexing chickens (Autosexing is when day old chicks can be sexed by their different appearances when they have hatched) that were ever created. They were developed at Cambridge University in England. 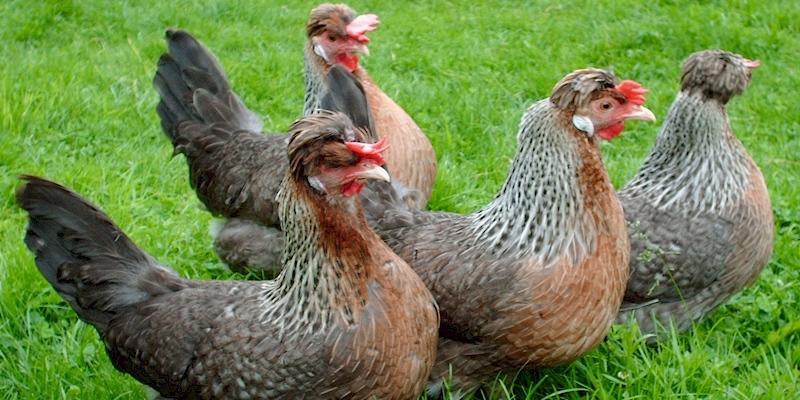 The Gold Legbar variety was first developed and was developed from a brown Leghorn rooster and Barred Plymouth Rock Hens, both from utility strains which were used in the first mating. The second mating took two of the male offspring, mating them with brown Leghorn hens. After producing many hundreds of chicks, selection was performed and then these birds were mated and from their offspring, light colored males with two barring genes were kept together with the Creem colored females. Silver Legbars were created using the Gold Legbar, crossed to the Silver Cambar. White Leghorns were also used along the way in order to improve egg production. The appearance of the Legbar is similar to that of a barred Leghorn. The Cream Legbar possesses in contrast to the Gold Legbar and the Silver Legbar a crest due to its Araucana blood. The roosters weigh between 2,7 - 3,4 kg (6.0 - 7.5 lbs) and the hens weigh between 2,0 - 2,7 kg (4.4 - 6.0 lbs). They are known to lay between 180 - 200 eggs per year. They have three color varieties: Gold, Silver and Cream. The Cream Legbar has a crest and lays blue to blue-green eggs. They are a muscular bird with a wedge shaped body and a prominent breast. They are wide at their shoulders but they taper slightly towards the root of the tail. Their back is long and flat while their moderately full tail is carried at 45°to their back. Their large wings are carried tightly and well tucked up. They have a fine head has a strong yellow- or horn-colored beak and a large erect bright red single-comb with five to seven even spikes. The crest of the Cream Legbar is small and compact and carried well back from the red or orange eyes, falling off the back of the head below the extended comb. Their face is red and smooth with smooth and pendant cream or opaque white ear-lobes. Their red wattles are long and thin and their neck is long and well feathered. They have yellow legs that are moderately long, strong, and free of feathers and their four toes are straight and well spread. They have a plumage of silky texture which is free from coarse or excessive feathers. The female has general characteristics similar to that of the male, allowing for the natural differences between sexes. The single comb however can be either erect or falling gracefully over to either side of the face without obstructing the eyesight and the tail is carried at a lower angle. The crest of the female Cream Legbar is somewhat fuller and larger than that of the male, but should never be so full as to obstruct the eyes. The legs and feet of female Gold Legbars or Silver Legbars can be either yellow, orange or light willow.